Raja M. Din MD, PLLC - We provide diagnosis and treatment of all types of digestive and liver disorders. We also provide screening for colon, esophageal, and gastric cancers. We take an integrative approach to digestive health. This includes paying careful attention to dietary and lifestyle factors, in addition to the relevant gastrointestinal symptoms. We appreciate the confidence you have placed in us and look forward to working with you. Staying healthy is a joint effort between you and your doctor. Your digestive team is here to listen and respond to your concerns. Our experienced doctor and staff are well equipped to effectively diagnose and treat your symptoms while working to minimize recurrences. Our compassionate physician will counsel you on the best ways to maintain and improve your health. 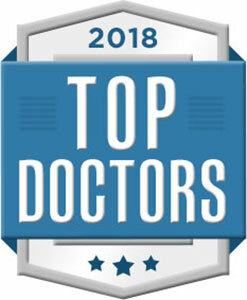 At our practice you will benefit from a dedicated team of trained gastroenterology professionals who give you the individualized attention you deserve. Dr. Din believes that informed patients are better prepared to make decisions regarding their health and well being. We expect you to commit to caring for your own health. That is why our website includes an extensive patient education section covering a full array of topics associated with gastroenterology including diagnoses and treatments for digestive problems. We encourage you to look through these pages whenever you have an interest or concern about your digestive health. Additionally, we periodically invite professionals to speak to interested patients regarding topics ranging from nutrition to managing Hepatitis C. Please let us know if you have a topic you'd like to hear more about and we will put you on our guest list! We strive to make our Greenbelt office as comfortable, efficient and convenient as possible. We have ample, free parking and are easily accessible by Metro. You can find all the information you need about our office right here on our website. This includes directions to our locations (both our Greenbelt office and the Greenbelt Endoscopy Center), maps, hours, insurance policies and appointment scheduling. Dr. Raja M. Din is board certified in Internal Medicine and Gastroenterology. 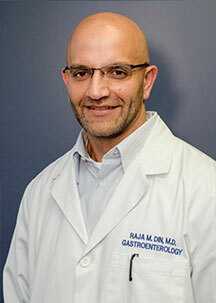 He completed his fellowship in Gastroenterology and Hepatology at Georgetown University Medical Center in Washington D.C. where he received advanced training in small bowel capsule endoscopy. Dr. Din completed his Internal Medicine residency at Prince George’s Hospital Center in Cheverly, Maryland after graduating in 1998 from St. George’s University School of Medicine in Grenada, West Indies.